This behind the scenes post is on the recreation of ‘my world’. Strabo brings Barry to the entrance of Eno, located in the secret basement of the antique-store. 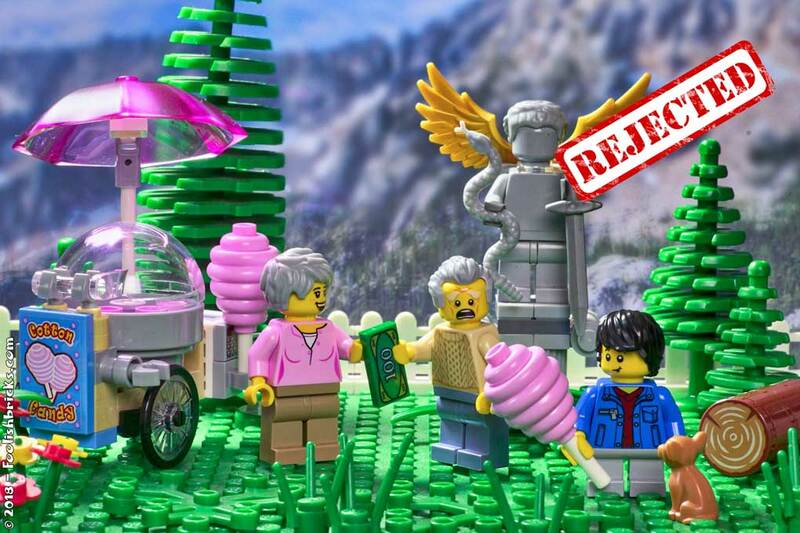 Figure 1 below shows the original panel from episode fourteen of the first Foolish Lego Comic. The focus is on the globe… the new world, everything else is out of focus and so secondary. With that in mind this image does what it had to do; introduce another world! Of course, again the photo suffers from the lack of proper lighting, it really falls flat in that department. There are also a few elements, like the dragon and owl in the image. The dragon is ok, but did not really work in the rest of the panels. The owl however, was a bit strange. An owl has nothing to do with Eno, the whole story is about the Godlike dragon. To my defence, I did not know that yet at that time ;). Furthermore, this was the first of the larger stages; in this image it doesn’t show and that should not be a problem, there were other panels following. What is a problem though, is the fact that I wanted to convey the feeling this was a secret cave with the portal embedded in it. This stage looked more like a basement, with a cave-ish wall. Figure 2 below shows the remake of this panel. I rebuild the stage with the idea this originally was a cave. The size of the set is even a little larger than the original now. 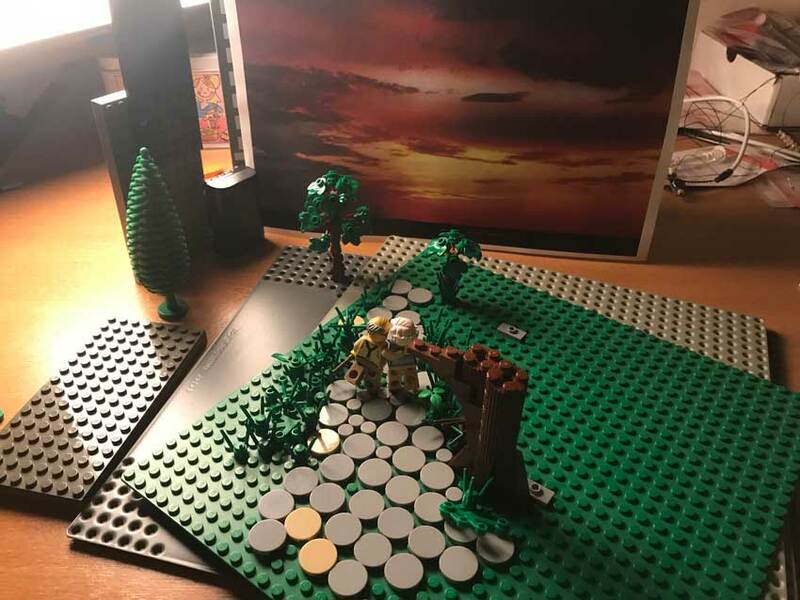 I tried to make the MOC a little more interesting and less square. Look for example at the completely self-build door. 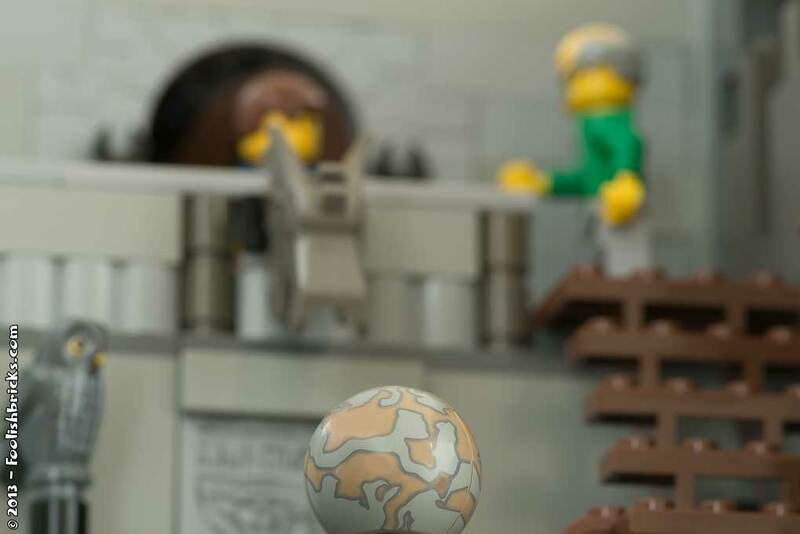 Figure 3 shows a behind the scenes build with another globe (at that point I could not find the actual globe 😛 ). Also, there is still an owl, later replaced with a Dragon-statue because that fits the story much better. Figure 3; Behind the scenes of the recreated my world stage. You can compare the new stage to the old one as seen in figure 4. I went for a long shot, showing the cave-like room. I wanted this image to be a bit more impressive, more in line with the impact of finding a “new world” on Barry. The globe is less present, but still in there. Bright lights on the second floor, and the closer you get to the portal, the more red and dark the scene becomes, signifying the growing uncertainty of the situation for Barry getting closer and closer to a new world. Below are the before and after images joined in one image. You can use the slider to show the one or the other. 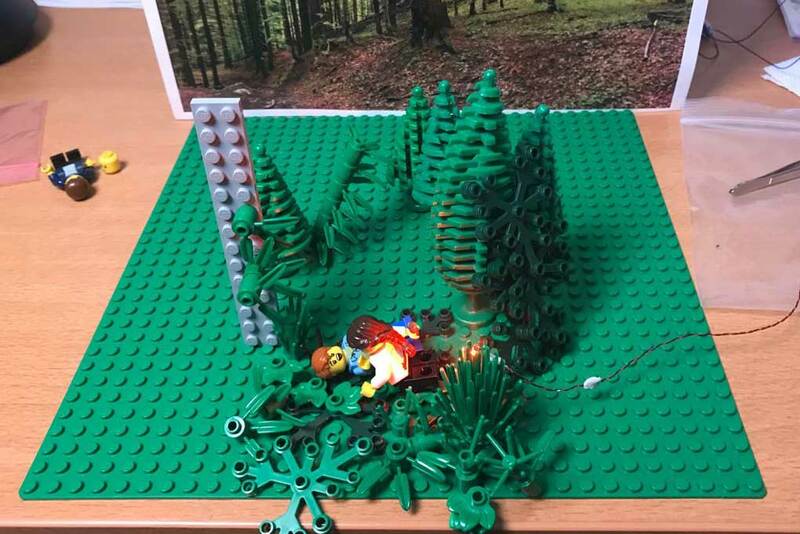 This behind the scenes post is on the recreation of the heavenly forest. Actually, this forest is not as heavenly as Darryl hoped for. At this point in the comic, Amida is not in for a friendly talk with our friend. 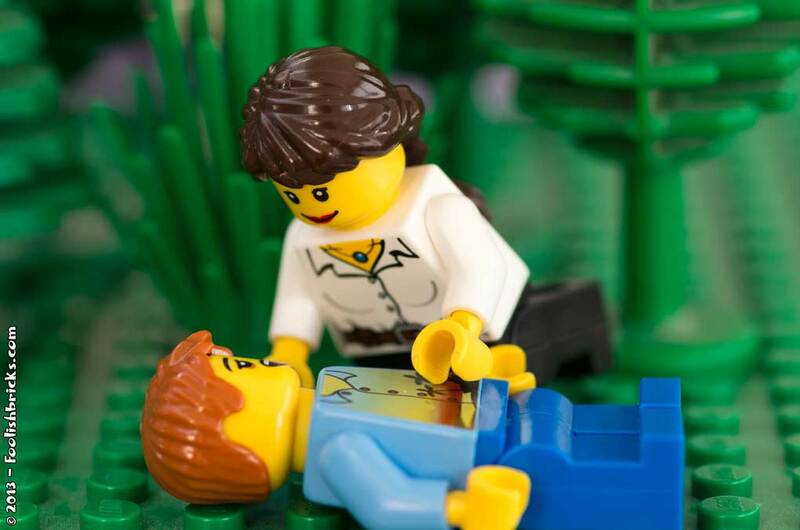 Figure 1 below shows the original panel from episode eleven of the first Foolish Lego Comic. Figure 1; the original heavenly forest. There isn’t too much going on in the image. However, the one thing that is going on, i always liked. I felt the posing of Amida as well as Darryl’s face was spot-on. Again the photo suffers from the lack of proper lighting, i remember shooting this image on a table in front of glass garden doors. I also remember this set was really small, just one green plate large. When I didn’t have much to work with, i used a close-up so I didn’t have to worry about the background. Yet, it did not work, if you look very closely, you can even see the corner of he table in left upper edge of the image. 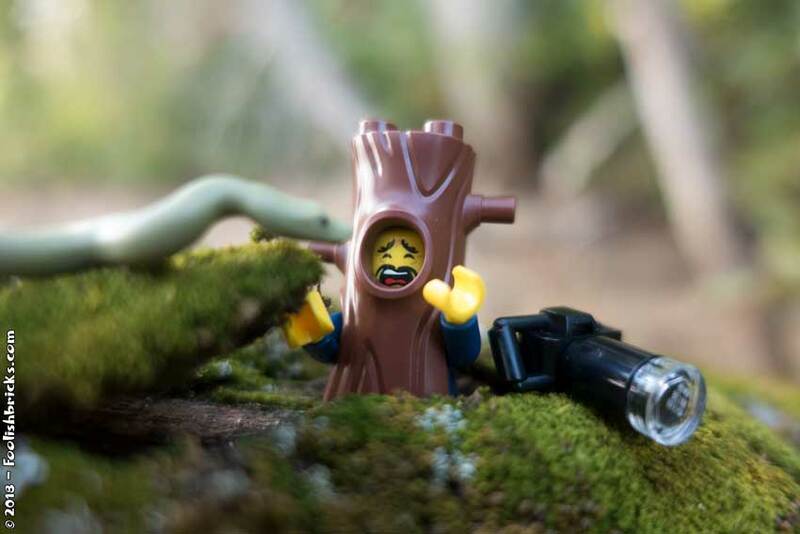 The set in itself is pretty disappointing too… a baseplate and three trees. Pretty remakable the panel worked in the comic, now that I think of it. In the next panel, Amida hits Darryl over the head with a stick, however, there is no stick in sight in this panel. Also, there is dust all over. For the recreation I decided to keep what I liked, the posing of the characters (with a small adjustment), and Darryl’s expression. I still used a small set. But filled it with all kinds of different plants and trees. I wanted the feel of a large, dark forest and the original image was far from that. By by changing the angle and using a printed background I feel I was able to create the illusion of a large forest even with using a relatively small stage. Figure 3 shows the behind the scenes. I also gave Amida a stick (behind her back)… this time she is ready to hit darryl over the head ;). In stead of a close-up, I went for a Full-shot, showing a little more of the surroundings. This way, Darryl and Amida go up in their surroundings. I used a lower angle and focused on Darryl’s bedazzled face. As compositional help, I used the Fibonacci spiral, making sure there is also enough negative space in the image. Dark, gloomy and green are the main colors. I also added a red glow on the back of Amida and the stick, conveying the danger Darryl’s in. You don’t need a gigantic set, to create the illusion of grand surroundings like a forest. Play with the angles, background and lighting and I’m sure it’ll work out. 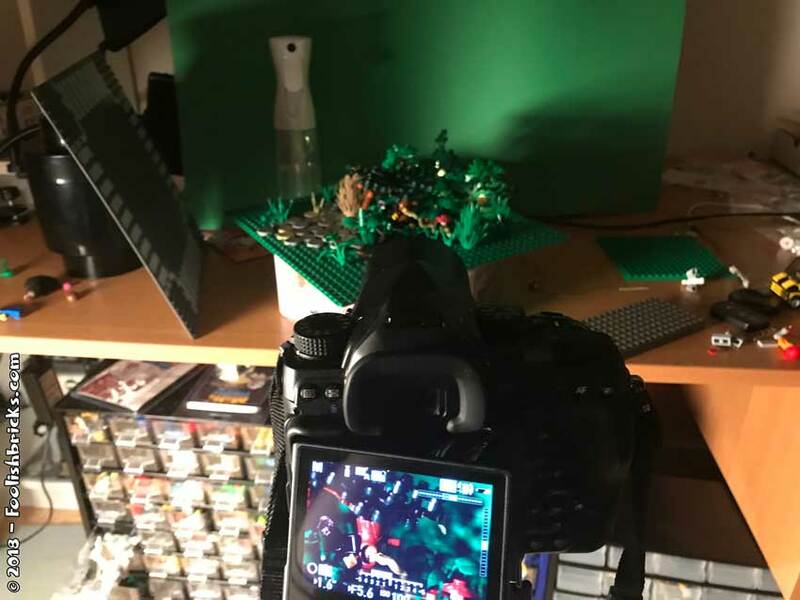 This behind the scenes post is on the recreation of Darryl’s disappearance in the first Foolish Lego comic. In a sense this was the point of no return for Barry. 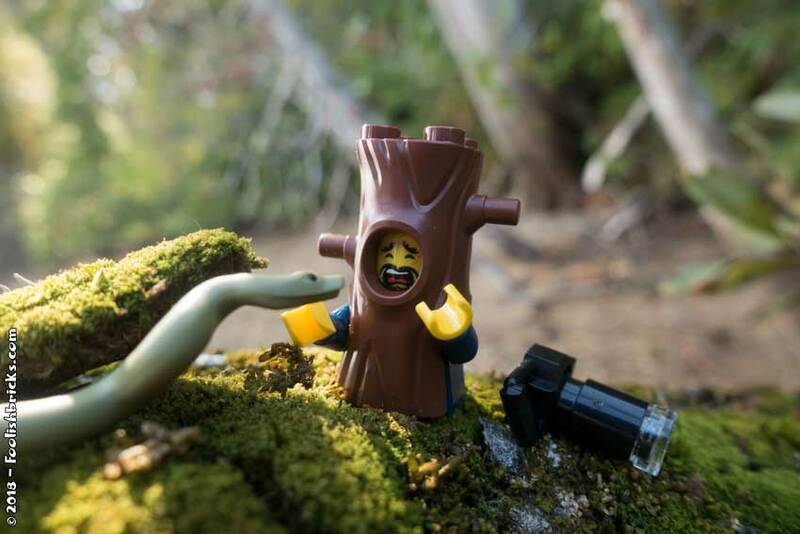 When Darryl disappeared, he could not back out of the adventure anymore. Figure 1 below shows the original panel from episode eight of the first Foolish Lego Comic. This stage was one of the first ones that was a bit larger than the others. I remember putting a more time into building it, yet, I still missed a lot of the building skills that I have today. What I like is that it does look like a library somewhat, and also a library that has been messed up by Amida in search of some kind of letter. Also there are some antique’s in the back, connecting the library to the Antique store. I also love the choice of face for Darryl. Because it’s almost the only thin we can still see of him, it really conveys his fear. As with almost all panels from the beginning the atmosphere in this photo suffers from the lack of proper lighting, I simply wanted to have everything illuminated and that was it. A thing that also annoyed me, is that the style of this stage was completely different from the style of the shop itself. There was no indication of a connection beyond the few antiques in the back of this stage. Concerning the perspective, the high point of view is not too bad, however, the use of depth-of-field is (again) confusing. 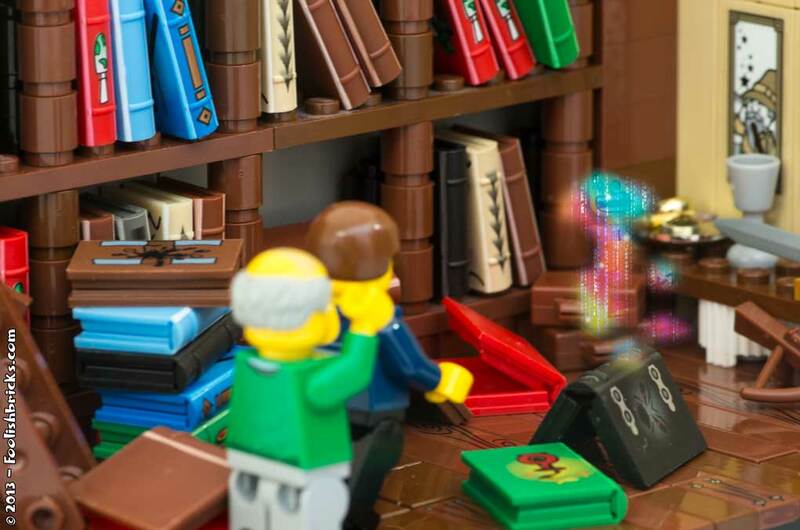 The one thing that is in focus are the books, and they are not that important. I’m guessing the attention of the reader will eventually reach Darryll, but it’s almost as if it is not THAT important. The lack of importance is also somewhat stated by the stance of Barry. He looks like he’s casually walking towards Darryl, not trying to reach him or anything. You might think he is in shock, but then I would’ve expected him to stand in place. You might also think the right lower corner is wrong; you can see the end of te floor there. However, this did not actually matter. The first comic had a different aspect ratio than the current comic. This meant that I needed to crop all photos in height, and thus, this mistake did not show up in the comic. I use the same style elements in this build, I used for the inside of the store, and even for the storefront; they are all combinations of wood and stone, creating the feeling of looking at on building. I still wanted to have some books, but also displayed a few other elements. The most striking difference in this panel is the addition of the statue. Eventually, this statue will be the entrance to the basement. A small visual hint to this is the key she’s holding. 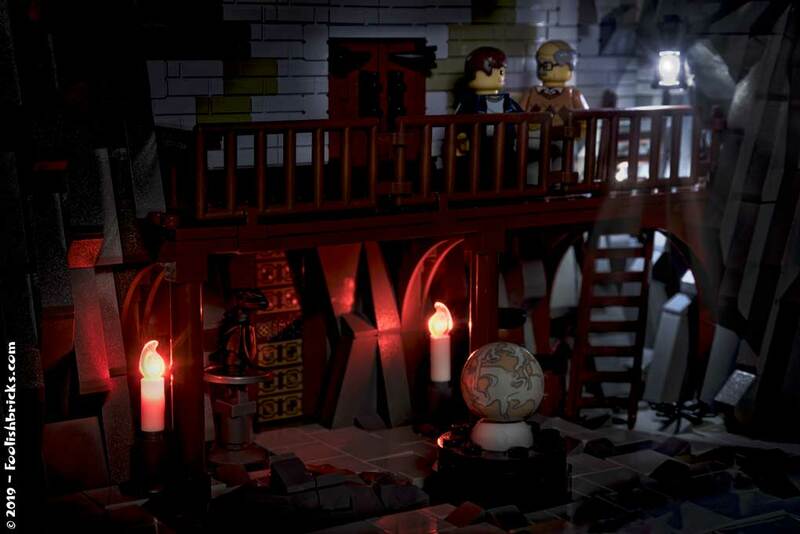 When Strabo speaks his ‘magical’ words, her candle wil light up, and the passageway will open. The one and only focus in this panel is the interaction between Barry and disappearing Darryl. Barry’s running towards Darryl, almost able to grab his hand, however in the next panel, he would’ve fallen to floor and Darryl would be gone. I also changed the perspective in such a way that both the faces of Darryl (the same expression as the original panel) AND Barry can be seen. NOW the fear/ fright of Barry shows, while Strabo looks more detached. Again, the color and mood are brought more in line with the inside of the store. With the addition of the blue color emitted by the (upgraded) effect of darryl disappearing. The effect of course is the same one used for the teleportation of Amida. Continuity is important in comics, not only story-wise, or concerning the location of characters and objects, but also concerning styles used. So, always try to build related stages to actually SHOW that they are related. 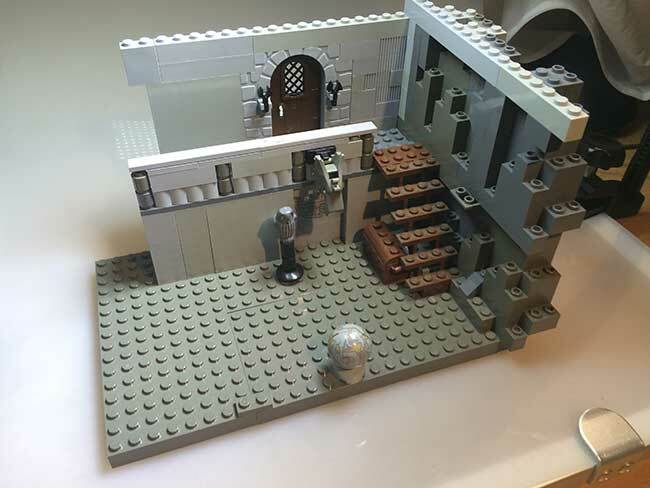 This behind the scenes post is on the recreation of the inside of Strabo’s store. 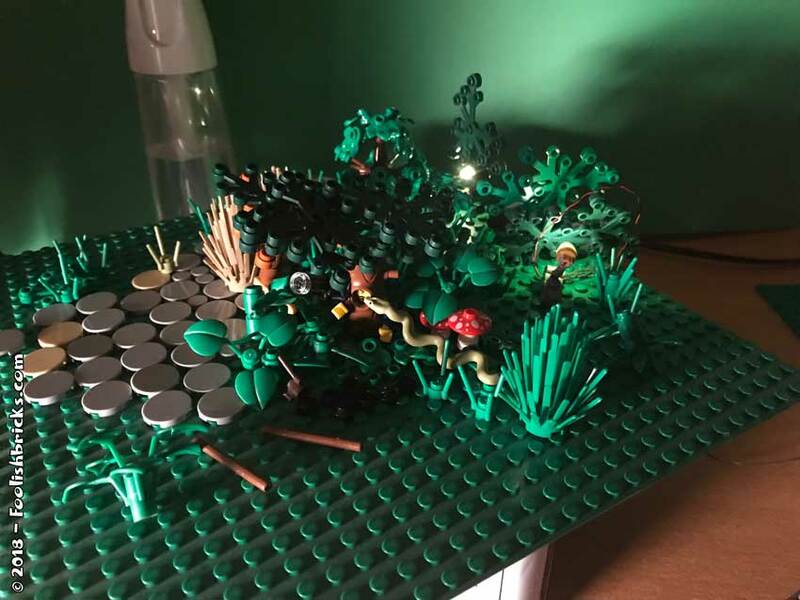 This one was more difficult than the first two recreations, because I feel the original Lego stage I build was not that bad. There are many old objects lying around. I still remember stuffing the scene with all kinds of old-looking Lego items. To me it does feel like a store in antiquities. I also like the perspective of this shot. It’s kind of an over the shoulder shot, the store seen from the viewpoint of Barry. Lastly, I really like the way Strabo is positioned. Casually looking at/ cleaning, straightening the image on the wall. All in all, I’d say, not too bad for the purpose of the comic. This build also suffers from the one thing each and everyone back then suffered from; lack of invested time and building skills. This is really obvious by the look of the wall and the floor. The wall lacks any contrast and some kind of variety in it’s look. It’s also kind of empty (that’s probably the reason for that chain hanging there). Moving on to the perspective, as I said, I like the viewpoint of Barry in this shot, yet, the use of depth-of-field is confusing. It’s unclear what is important in this panel. Is it Barry or Strabo? The way it is now, only part of the store is in focus; hardly the part the readers should be focusing on. The focus should’ve been on Strabo, especially since the shot has been set up as an over-the-shoulder shot. Furthermore, the atmosphere suffers from the lack of proper lighting, I just did not pay ANY attention to the way the scene was illuminated. Lastly a nitpick, the location of that gladiator helmet should probably have been more to the front of panel since Darryl will be picking it up when both Barry and Strabo weren’t paying attention. Figure 2; The recreation of the comic-panel. I still wanted the look of a small, crowded and messy store, where all kinds of objects are lying around. And even if there are less objects within the frame, i believe I pulled off the look. Also, to create some depth, I placed several objects, out of focus, near the lens. Lastly, I thought it would be nice to have the door and some windows in the shot so I could play with light-fall. 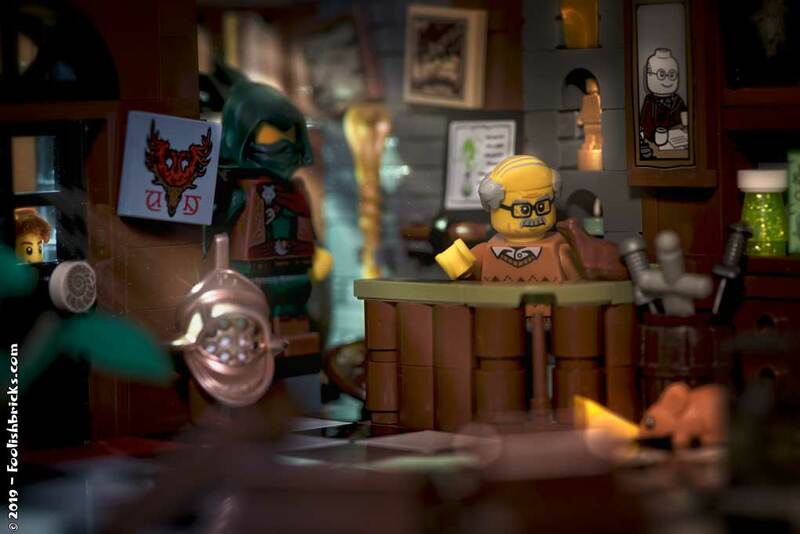 There are a two foci in this image, first Strabo in his little shop (this is the main focus), second Darryl peaking through the window of the door. 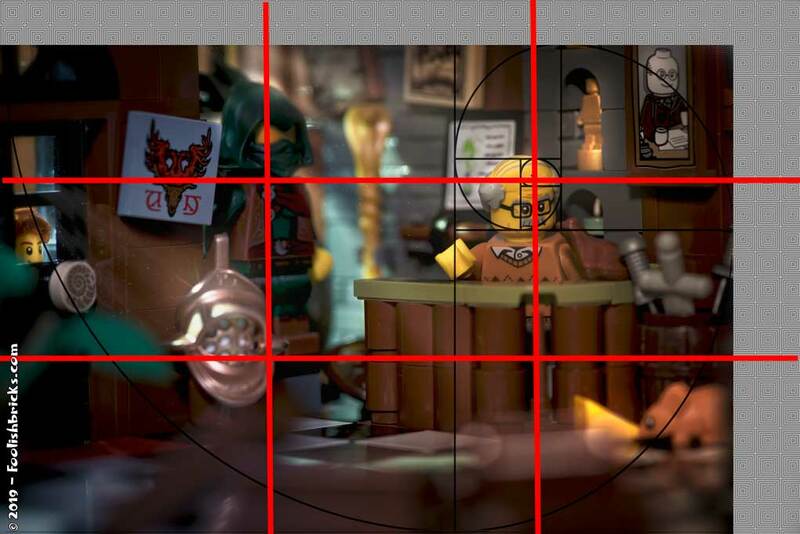 Using the golden ratio, Strabo is positioned quite right. However, if I use the Fibonacci-spiral, this photo should’ve been cropped at the top and right side. I decided against this; the stage is already more extensive than is shown in the image and I didn’t want to loose more surroundings. 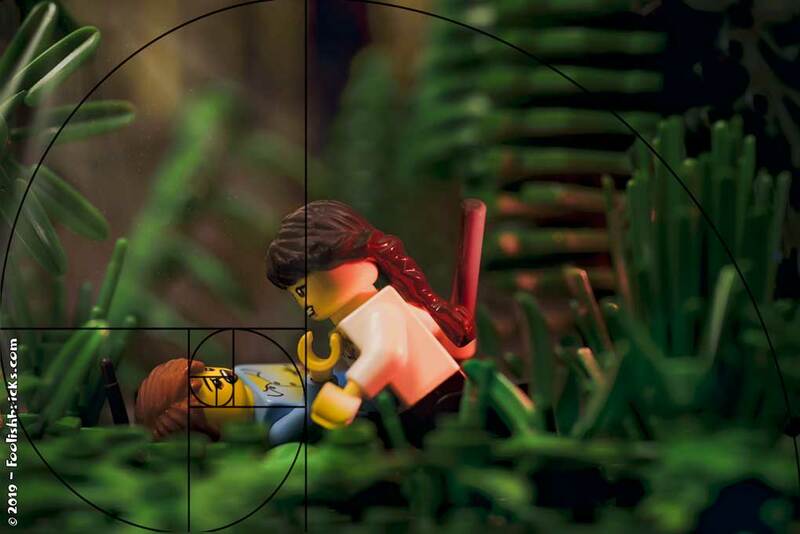 Figure 3; Golden ratio (on the original size) and Fibonacci spiral within proposed crop. Still, playing around with the Fibonacci spiral shows there is a pretty decent flow in the image going from Darryl, via the mouse to Strabo himself (Figure 3). Even though the outside of the shop, and also the interior, is a bit darker than it was I felt the lighting should convey a warm feeling. So, there are a lot of yellow-ish colors in the scene. The lights through the window should create a bit of a mysterious atmosphere, but I am not convinced that actually worked. I changed Strabo’s green sweater to this one, I simply didn’t like the first one. When I first use Strabo I did not know he would play such a large role in the comic, otherwise I would probably have gone for another print. For this reason, I had to change his position, the back of this torso does not have a print on it. Furthermore, it’s nice to have all kinds of little easter eggs in an image. For example the light grey sword is a genuine antique sword. This one is from one of the sets I got as a kid; the illustrious “Yellow Castle (375 – 1978)“. Also the helmet has a more notable postion, light and highlight. And it looks as if it already caught Darryl’s attention. Lastly, there is one more giant easter egg concerning the (temporary) faith of Barry and Darryl in the first Foolish Lego Comic. Do you know what I am talking about? This time I realised rules aren’t rules, at least not when it comes to photography. Looking at the composition of the final image, I’d much rather use the compositional rules and consciously break them too. As long as the final shot feels good to you and you thought about what you wanted to achieve by breaking conventions. 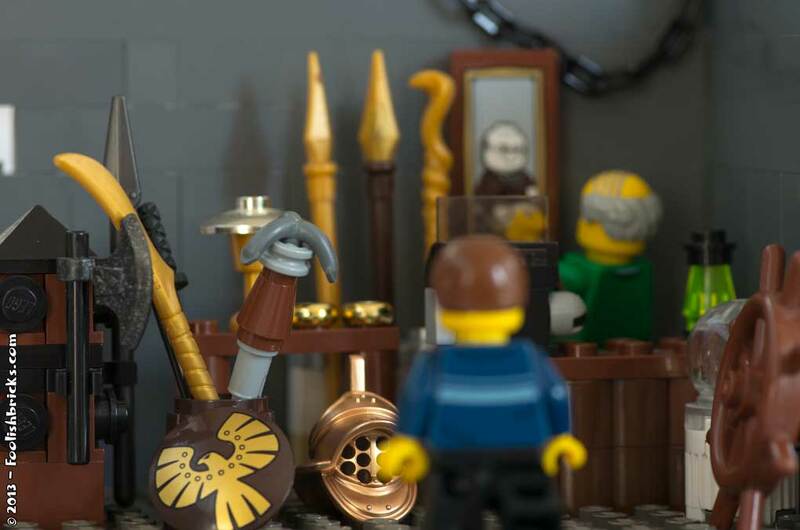 For the second recreation I decided to recreate Strabo’s antique shop. Those who already read the comic, know it’s an important location and I never felt the storefront I created back then, did it’s importance any justice. In the old days I build most locations within half an hour. If I remember correctly, this one even took below ten minutes. And it shows. 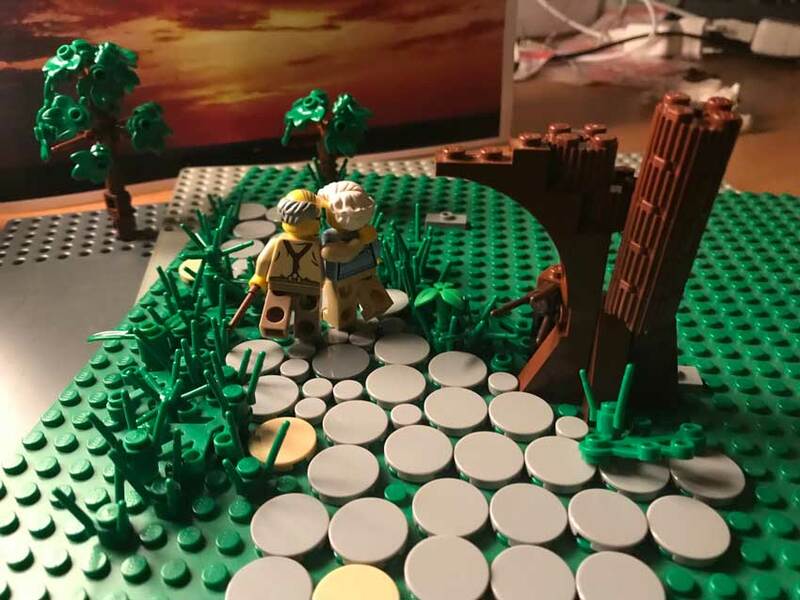 Below is the third panel from the second episode of the first chapter of the Foolish Lego comic: “Could be an adventure” (Figure 1). It was published August 24th 2013. 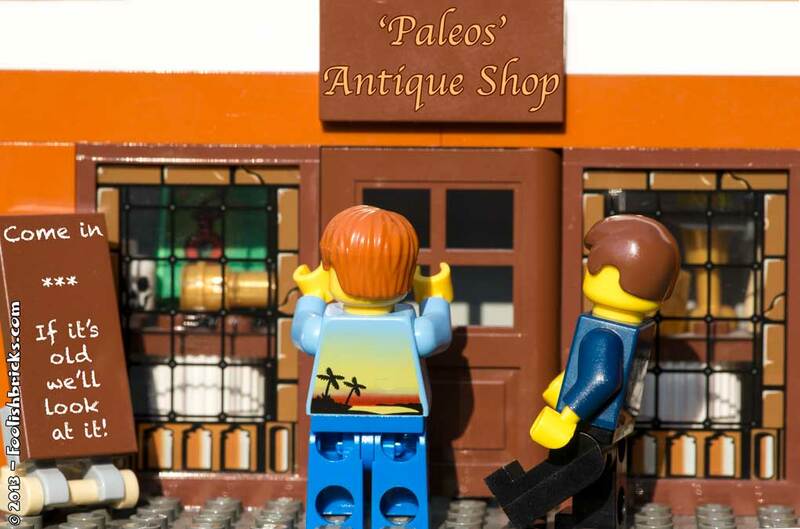 Darryl – hoping for some kind of an adventure – convinced Barry to go to the antique shop to ask about the stolen dragon document. At the very least, this panel establishes the fact that the reached the store and are going in. Also, Darryl looks somewhat more enthusiastic compared to Barry. I personally liked the sign too though it is not very accurate since there is only one shopkeeper. Again, I’ll start with the little things. The image is somewhat crooked; it looks as if I wanted a symmetrical image (with the exception of the sign), but it isn’t, besides that the lower part of the image is rotated somewhat compared to the upper part. Furthermore, because I created a very small Lego MOC as a stage, I zoomed in way to much. Usually a zoomed in panel means something important or intense is going on… but there isn’t. Also, Barry has a very strange stance. It’s like he has a problem with his extrapyramidal tracts; both arms besides his body, almost falling backwards. Lastly, even though some stuff can be seen trough the shop windows, it is kinda dark and there is obviously a plate behind the door. Below in figure 2 you can see the recreation of this panel. This time, I build a modular-size MOC of the antique store as a stage. I always like to add a few details these days even if they don’t show in the final panel. An example of this is the doorknob; it’s the print of an old fossil, als there is slightly more in the shop windows than can be seen. Because of the larger build I could zoom out a bit more and in stead of using a medium-shot, like in the original panel; I could use a long shot (wide shot), establishing the location and immediate surroundings. The camera angle is slightly from above, giving a better view of the situation. The recreation is more dark than the original panel. Shooting the original image I didn’t have any lighting setup so I shot the image outside in the sun. For the recreation I still didn’t want a dark image, bit also not as bright and sunny as the first panels in the comic. Darryl and Barry are slowly moving towards unknown territory besides I feel the store is a quasi back-alley where less sunlight comes in compared to the main street where the comic started. Color-wise; Barry and Darryl are still bathing in golden sunlight, while the right side of the image is darker, and more blue. Lastly, the small amount of vignetting I did to show a new scene has started (Like in a few old films where a scene ended and started with a circle closing and opening). I added a few easter eggs related to dragons. And those who read the whole comic, might recognise the knights’ armor in the window. You can also see the creature (Noldor) peeking around the corner more clearly (Did you know that he is actually present in episode 1 and 2? ), raising questions about what is going on. That’s it. I hope you enjoyed the post and that it might inspire you to look at past work you did (it could be anything), and see if you can remake and improve that work. Lastly, if you have any feedback on these recreations, please let me know in the comments; live and learn. Did you know you can also subscribe to Foolish Bricks? If you do, you will receive updates from the surreal world of Foolish Bricks. It is time for remakes! 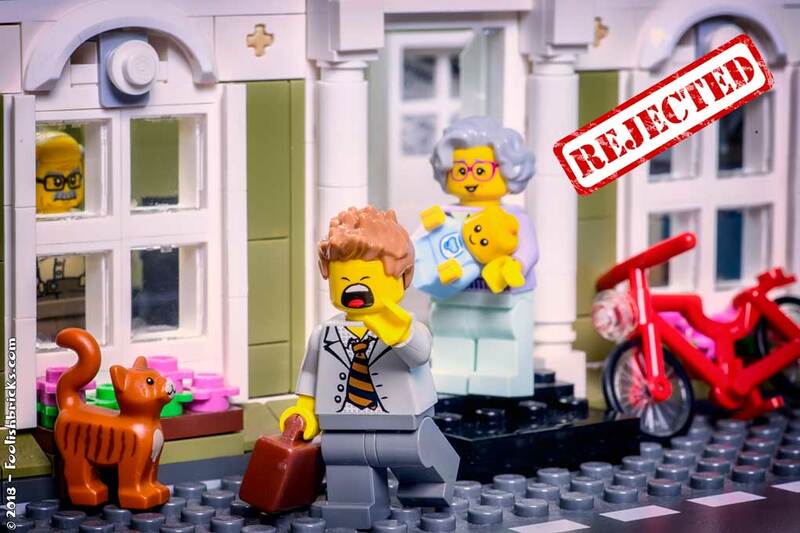 Over the years, my experience in creating Lego comics has grown somewhat and it’s already been over five years ago since the first episodes of the Foolish Lego comic were published. That’s five years of experimenting and creating my brick comic by trial and error. Many times before I’ve written about how I would’ve liked to have written the story differently. And of course, in hindsight, there were more aspects in the comic that could’ve been better than they were back then. However, I have to start with something and that is a recreation of some of the comic panels. When I started the comic, I mostly concentrated on the quality of photography. So, as long as everything was in the frame, I was happy. Nowadays, there are other things I consider too, each time I shoot a photo for one of the panels. This year I will take a look at past episodes and try to improve some of the individual panels. This will be within the context of the story up until that point and, of course, within the, relatively unimaginative, four-panel-formatting. 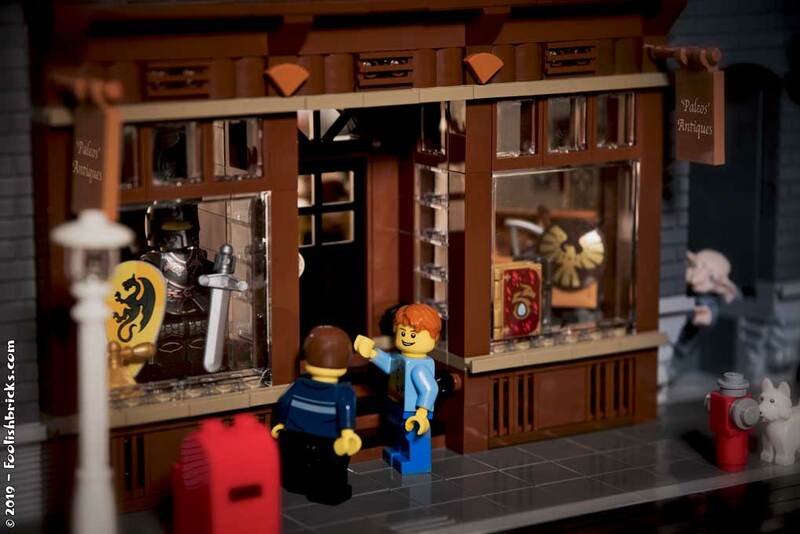 Below is the third panel from the second episode of the first chapter of the Foolish Lego comic: “Thief!” (Figure 1). It was published August 17th 2013. Barry and Darryl have just met, when a woman (Amida) steals a document from Barry. Our two protagonists chase her until she runs around a corner and vanishes into thin air. I like the fact that it looks like a sunny day and, considering my photoshop skills in those days, the teleport-effect is not too bad. For some reason i am also fond of the white stripe on the window/ door behind Amida. Finally, i like my use of depth of field. It puts the focus on Amida and shows that Barry and Darryl are behind a little. First off, the little things! There’s dust (!) on the tiles, the flower is crooked and even the background is a little tilted. That last part would not have been a problem if it wasn’t by mistake. If it was intentional I should have made the tilt more clear to create a Dutch tilt, thus conveying a sense of ‘uneasiness’. Also, everybody’s happy, I did not pay any attention to everyone’s facial expressions. Even though I kind of like the transportation-effect in itself, it is a little out there. The colors have no meaning (and they look like the colors – red, yellow, green, of carnaval in my city Maastricht). Furthermore, the composition is a bit boring and misses tension. All in all, I don’t believe it’s too bad, but there is some room for improvement. Figure 2 shows the remake of the teleporting Amida panel. I changed quite a few things. A significant change is that I wanted to show that Barry and Darryl actually saw Amida dissolve. I always felt that the reason for those to going to the antique-shop were a bit weak, and actually seeing the thief mysteriously disappearing might’ve been a stronger incentive to seek an explanation at the shop. One of the main changes I made is in the composition. I used a low angle shot to make Amida look strong and powerful. Because of this angle Barry and Darryl sink into the ground a little because they’re a bit further away. This dwarfs them somewhat compared to Amida, adding to her current dominance (it also makes the flowerpot look smaller, which is annoyingly large in the original image). Combined with the depth of field, and the space Amida gets in the frame, she is undeniably the main focus of this panel. 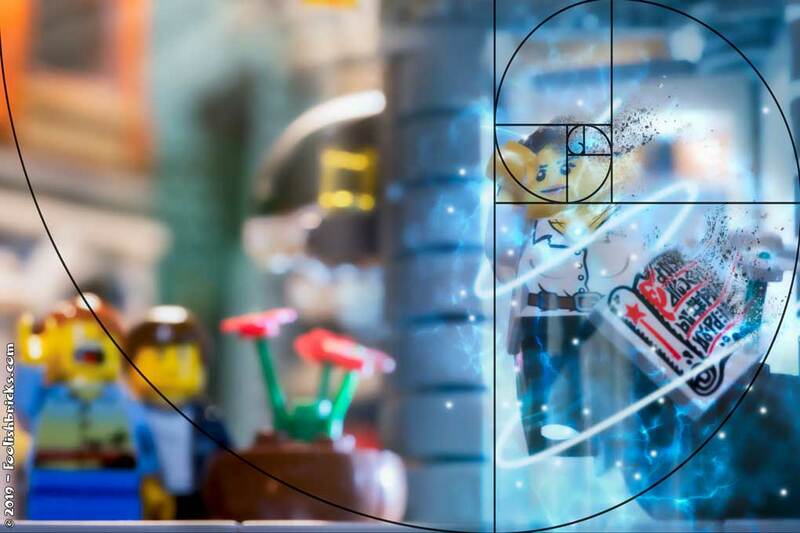 Also I tried to balance the composition a bit more by, amongst other things, using the Fibonacci-spiral (Figure 3). Figure 3; The Fibonacci-spiral as compositional help. Obviously, I changed the teleportation-effect. Simply by making it ook a bit more spectacular and coherent, besides making Amida float in the air a little. In the original panel it was not immediately clear that she was disappearing, so I added a dissolving effect in the remake. There is a distinct difference in color within the panel. On the left we see Darryl and Barry, stil in their own, golden-yellow, warm, sunny world. As opposed to Amida bathing in blue. Blue is seen as cold; conveying contrast in their current worlds/ thoughts. Even so, blue is also the color of tranquility and faith. And red is not used within this image… maybe she is less violent and/ or evil than Barry and Darryl might think at the moment? The facial expressions are different, a yelling Darryl, a stunned Barry and a relieved-that-it-worked Amida. The specially observant readers might notice the glowing blue necklace; might that be the transportation-device? The remake would (mostly subconsciously) have brought much more emotion and tension to the story, besides conveying more visual information and possibly even questions. Usually I don’t have the time to think about panels this way, however, recreating this panel was a real eye-opener to me, mainly because it all came together relatively easy. Next time a new panel. For now, thanks for reading. Did you know you can also subscribe to Foolish Bricks? 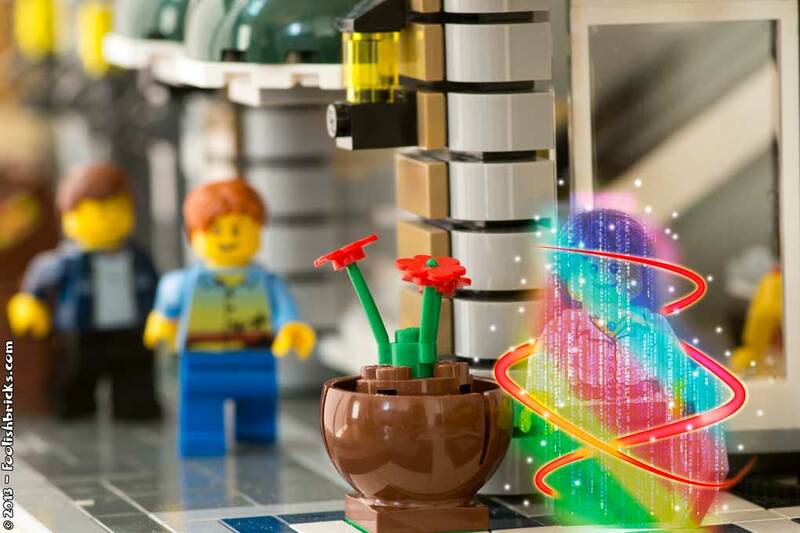 If you do, you will updates from the surreal world of Foolish Bricks. As many of you might know by now, my biggest problem is inspiration! I often need hours to even think of a feasible idea. Because of this, once i have an idea that might work, i don't ditch it right away if the photo itself does not work. Being in Canada for work, I only had limited (plastic) resources and time to get some photography done. In the end I only created one image I liked ("Eye of the beholder"), but of course I shot a few more images that did not make it. 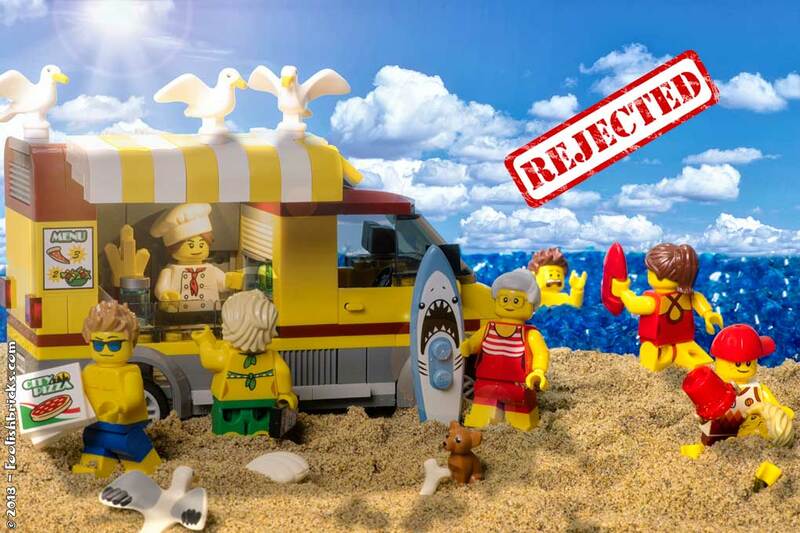 Before I create a "rejected Lego photography"-post, I usually wait to see if the idea is still usable. This idea I tried in nature (under time-pressure), resulting in the images in figure 1 and 2. In hindsight they weren't too bad, but I didn't like the light and for some reason the fact that I didn't use the legs, did not feel right. Also the images looked out of focus to me. sadly, in the end I did not have the time to redo them. You can also see a few tiles on the left... this plate I used for another photo before; "the startled guard". Ultimately, I don't know if I like the resulting image yet. The lighting is nice, but not really logical with the light coming in from the left versus the darker side on the right... I explained it as being dawn, but there's something off. Anyway, it's not a stunner... but it'll have to do for now. To learn is to make mistakes. Over the years I've made many Lego photos. The first two years, because of the time-pressure of a 365, I published every photo I made. For better or for worse, readers of Foolish Bricks could follow my growth, and also see every mistake I made. Eventually, there were many failed images. The last few years, I created less images, but still published (almost) every image. This year I decided to stop publishing images I was not happy about. Yet, it can be very helpful to keep them in mind. Once a mistake is made, i might be able to avoid it in the future. So, following are three of the images I rejected. The premise of this image was of course my newborn and the non-existent sleep at night :). However, I just couldn't get this image right. For some reason the colors are off. The green just does not work for me. I tried to make this image 'pop', but I did not figure out how. It was just not there. There was just too much going on in this image. It was one of my first attempts at a backdrop, it did not look very natural. Furthermore, I just had to do too much to make it look a bit natural. The backdrop, the sun, the color-adjustments, the shadows. It was all too much. Besides I had a rel light in the car, but it did not bring anything extra to the image. All in all, a disappointment and so I rejected the image. Another try at a backdrop. This time I tried many things, and this image was shot with my computer-screen in the background. It ruined all the lighting and colors in this image, making it all way too unnatural. It simply looks as if it was shot in my basement. There will be posts like this once in a while. I feel this is a nice way of using my rejected images, maybe someone will benefit from them. Or - even better - if anyone has an idea of how to improve them, just let me know! 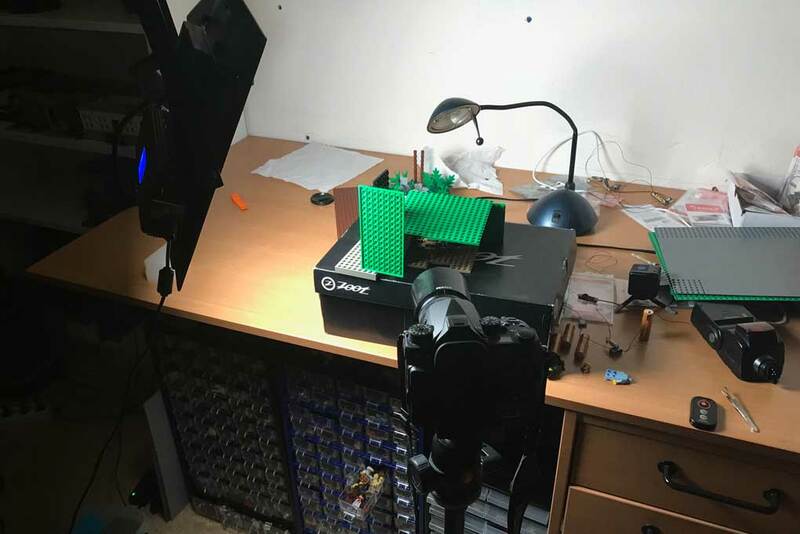 Behind the scenes: "Good old times"
This is a behind the scenes post for the Lego photograph: "Good old times". This time I was looking for a happy emotional scene. And again, I wanted to try something complete new to me. I had seen a lot of toy photographers use photos as a background. Up until now, I never did. I always feared it would look too artificial. Yet, a few months back i did print a few backgrounds... to be put in a drawer unused. One of these backgrounds was a sunset. The sunset struck a cord. 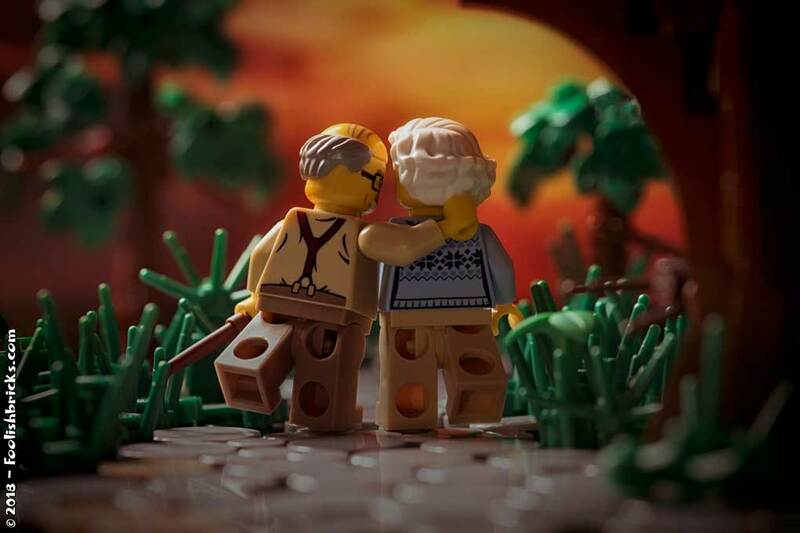 It got me thinking of a couple walking into the sunset. For some reason an earlier toy photo of mine entered my mind: "Lonely old man". That brought me to the decision to use an elderly couple. As stated I used the sunset picture as a background. Lighting could also be relatively simple this time. One light as far to the front as possible. Because I did not succeed in putting it directly in front, I put it to the side a little as shown in figure 1. The plates to the side serve two purposes; first and foremost they prevent direct light from entering my lens. Second, they regulate the lights/shadows on the trees and couple a little. Typically I build the scene before I do the setup. This time I Used the path from the 'startled guard' image and put the couple on there as he center of the image. Next i placed the camera, framed and lighted the scene. Only then I started to build the scene, constantly looking through the cameralens for the effect of everything I added. 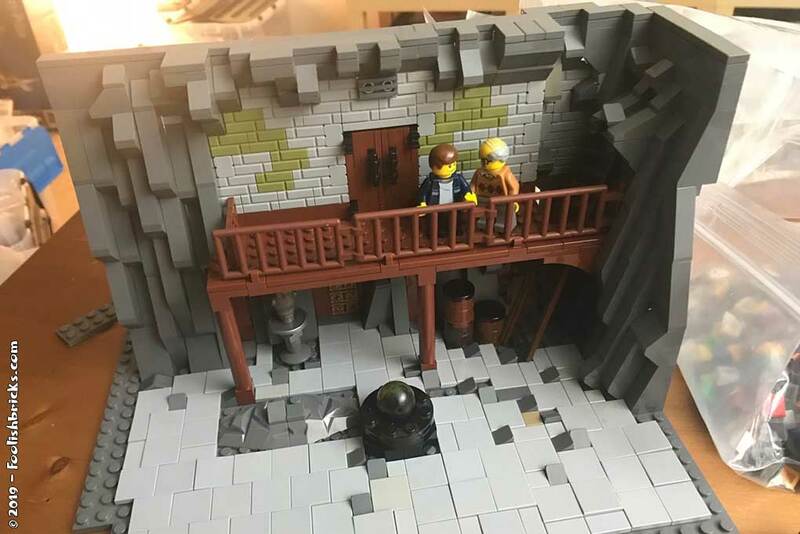 I did something like this before in the 'back alley ghost' image and again I was surprised at how few Lego bricks were actually needed to fill the scene as you can see in figure 2. Take a special look at the trees. The small tree in the back right was used for adding a little depth. Because of the contrast with the much higher tree on the left, it looks as if the tree on the right is much further away than the one on the left (forced perspective). Also take a look at the ugly big tree in front. I could have build a stunning tree, correct and beautiful. However, it would've never shown in the photo. Because I was a little short on time this tree was build brick by brick, looking through the lens for the effect of every brick. The illusion of a normal giant tree is there (I think). I took the shot with a f100 mm Pentax macro lens at ISO 100, aperture f/5.6 and shutter speed 1/60. In post-processing i added vignetting and adjusted the levels a little. The resulting image is below. In the end, I am not completely happy with the effect of the background. It looks... well... like a photo in the background. I'll have to see how I can refine the technique, so if you have any tips, I'll be happy to hear them. Have you ever used photographs as background in your photography? How did that work out? Behind the scenes of the Lego photo: "Hope"
This is a behind the scenes post for the Lego photo: “Hope“. For this image I wanted to capture a dark image wherein light would play the starring role. I would’ve liked an image that was dark in nature, yet with a glimmer of happiness, serenity or hope. After some time I decided to work with a prison image, with a prisoner showing some kind of peace with the situation. The final image changed quit a bit from the first concept in my mind. 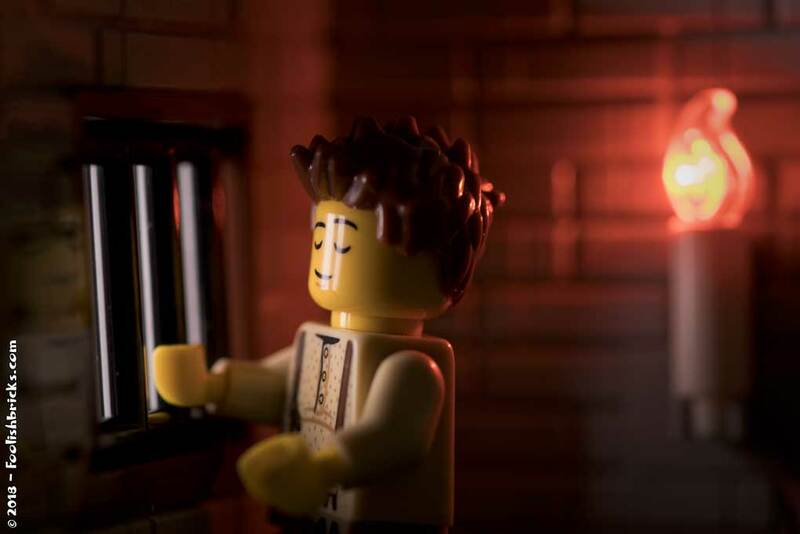 I build a small prison corner and put the minifigure directly in front of the barred window so the warm yellow light could shine on half his face. 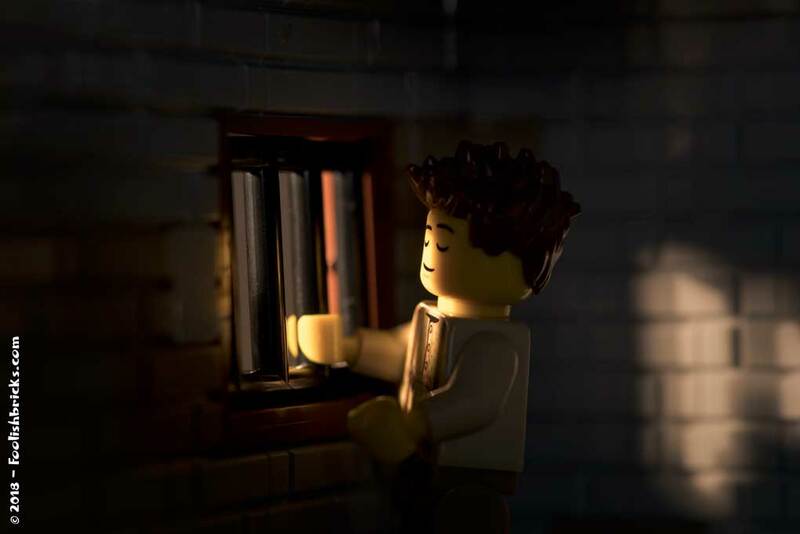 I used the sleepy head so it would look asif the imprisoned minifigure would seem to be silently enjoying the warm rays of sunlight with his eyes closed, remembering better times. That did not work quite as well as I hoped. Because the minifigures have flat round heads, all contrasts that could provide depth in his face got lost. 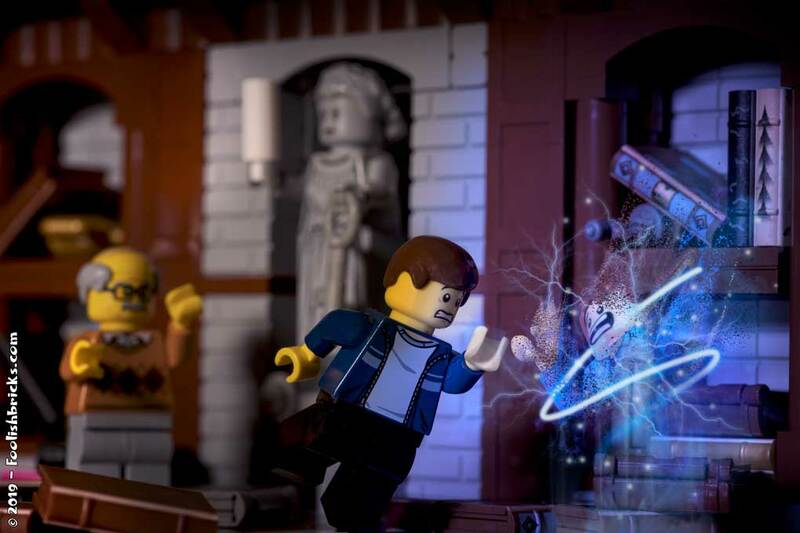 Also, you couldn’t see anything from the inside of the prison because of the darkness behind the minifigure (figure 1). I tried adding a second light behind the prisoner, but that looked really artificial and unbalanced. I needed some kind of light source behind the prisoner. Next I tried a candle on the wall. This could’ve worked, yet, I wasn’t looking for contrasting light sources, so I removed it again (figure 2). There was more of the prison in the image, yet, there was too much focus on the barred window itself. I needed the focus on the prisoner (figure 3). Then it struck me; I simply had to move the prisoner away from the window! 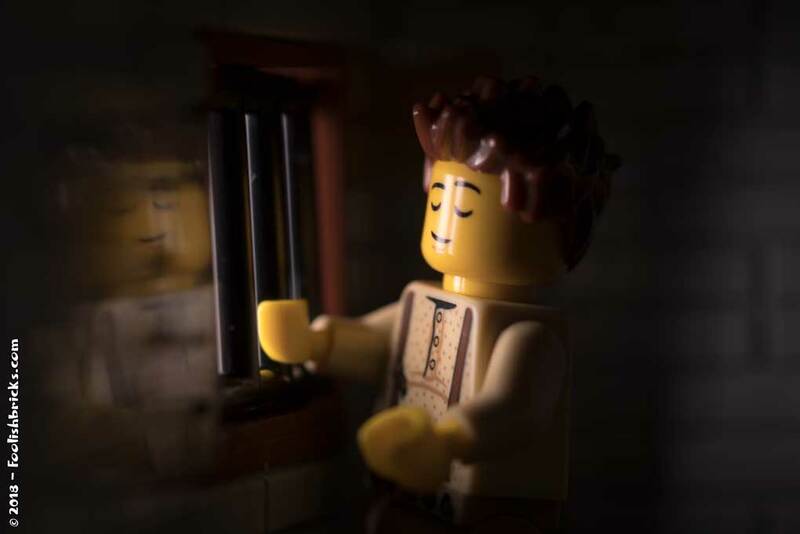 This way I could use the natural light hitting the prisoner AND the wall, I could use the structure of the whole minifigure for depth and I wouldn’t need a second light source. So that’s what I did. I added a few smalle details, like the bucket and (of course) a rat. That was it. You can see the final setup in figure 4. You’ll notice the large plates outside of the walls. This is something I do in almost all my pictures and keeps the light from bleeding through the slits of the Lego blocks of the wall, especially if the light is shining perpendicular on the walls. This photo didn’t need that much work. The only thing I did was lighten op the whites and shadows in camera raw (photoshop) a bit. The before and after is below.